Signing Adam Ottavino seemingly put a bow on the Yankees' reloading of their pitching staff. However, a few questions remain. With a dynamic top six in the bullpen and a set five-man rotation, the Yankees have given themselves an initial leg up in the AL pennant race as the Red Sox look for bullpen help, and the Astros face significant turnover in their staff. To begin the offseason, the Bombers had three holes in their rotation and two holes in the bullpen. Those are all gone with J.A. Happ, CC Sabathia and Zach Britton re-signed while James Paxton and Ottavino have been brought aboard. It's been 2 1/2 months since the Paxton trade, so it's easy to forget how much of an upgrade he could provide. But the 2018 Yankees didn't win 100 games with just five starters and six relievers, no matter how good those 11 pitchers are. In recent times, even the best teams have often had to dip as far back as a dozen starters deep with injuries and rest concerns. Furthermore, with starters' decreasing workloads, the seventh and eighth spots in the bullpen take on larger importance while often shuffling during the season. For now, assuming the Yankees carry eight relievers, the favorites for the last two bullpen spots on Opening Day are clear: Tommy Kahnle and Luis Cessa. Why those two? Both are out of options and would need to clear waivers to be sent to the Minors, something neither is likely to do with plenty of teams aching for pitching help. Kahnle's 2018 season was disappointing. Coming off a breakout 2017, the flame-throwing right-hander pitched to a 6.56 ERA in 23 1/3 innings while walking 15 batters. Prior to 2017, he'd had control issues, so his breakout season may be the outlier. However, Kahnle dealt with nagging injuries all season, so it's fair to speculate that he could return to form with a full offseason to recover. Still, he needs to prove his health and cull his walk totals to remain rostered. Meanwhile, Cessa has made frequent trips between New York and Scranton over the last three seasons. He's been the top spot-start candidate, but he can no longer wait in Triple-A. With the Yankees needing a long reliever, he's the obvious candidate as the other competitors have options and can get starts in Scranton. 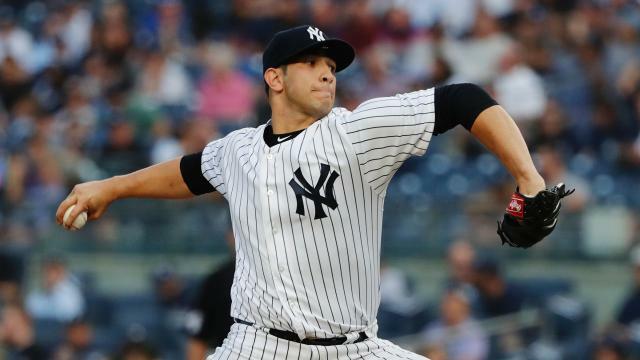 Would Cessa's stuff play up in the bullpen? He's gotten infrequent relief opportunities over the last few years and has a mid-90s fastball to play off. Cessa is a converted position player, so despite turning 27 on April 25, he could still be tapping into his potential. A consistent stint in the Major Leagues teamed with MLB coaching could help turn the tide for him. Beyond those two, Stephen Tarpley would be a potential next-man-up on the 40-man roster. The lefty earned a postseason roster spot as a matchup lefty and could give the Yankees a different look in the pen. Fellow reliever Ben Heller is recovering from Tommy John surgery. Then there are the potential sixth, seventh and eighth starters. Alhough they'll be with the MLB club in Spring Training, Domingo German, Jonathan Loaisiga and Chance Adams should slot into Scranton's rotation to begin the year. The need for a spot starter remains ever-present after the Sonny Gray trade with Paxton, Sabathia and Masahiro Tanaka's injury histories, though German and Loaisiga haven't been beacons of health either. Adams is a former top prospect for New York, but he struggled repeating Triple-A in 2018 and will need to regain favor before passing German and Loaisiga in the pecking order. Veterans Drew Hutchison and David Hale signed Minor League deals, but neither are awe-inspiring options. If the Yankees want to improve their starting depth, they could still look to free agency. There are plenty of starters out there, ranging from former Cy Young winner Dallas Keuchel to reclamation projects like Nate Karns. The Yankees are reportedly still pursuing veteran help, which makes sense. However, targets like Gio Gonzalez or Ervin Santana may be wary of coming to the Bronx with an uncertain opportunity and a short porch at the Stadium. Then there's Jordan Montgomery. Monty made the rotation to begin each of the last two seasons, but he's on the mend from Tommy John surgery. He underwent the procedure last June and that puts his earliest return at midseason. With recovery times often stretching to 18 months, he may not see the mound in the Bronx before 2020. Simply put, anything the Yankees get from Montgomery in 2019 will be gravy. Compared to other pennant hopefuls, the Yankees have the most complete 25-man roster at the moment. Still, no team reaches October looking like it did in February and March. How the team fills out its final spots and depth will go a long way to determining if New York will win its first division since 2012.